Skip the costly specialized tool and achieve the same results—straight, clean cuts through large-diameter PVC pipe—with a couple clamps and your trusty hacksaw. 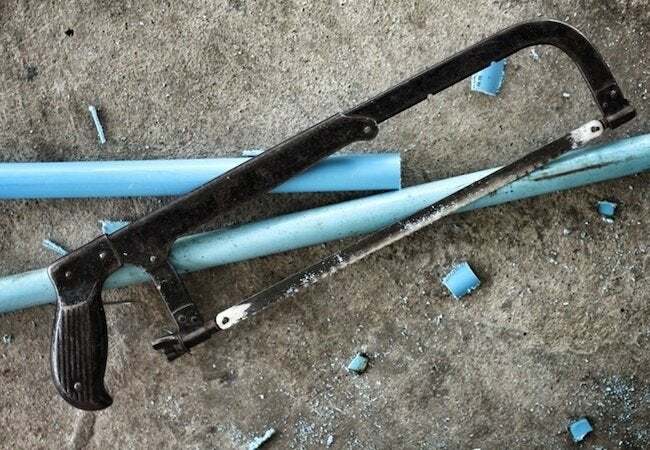 If you’ve ever tried using nothing but a hacksaw to cut through PVC pipe, you know it can be challenging. Often, particularly for smaller-diameter pipe, it’s easier to use a tool specially designed for the purpose. But while some PVC cutters are inexpensive (about $15 or so), the models that can handle larger pipes tend to cost considerably more. Fortunately, there’s a do-it-yourself solution that can save you a trip to the home center. Grab a couple of ordinary ring clamps and place them on the pipe, one on either side of the spot where you want to cut. Leave about an eighth-inch gap between the clamps—just enough room to comfortably accomodate your saw blade. Then, saw away! To make the job even easier, spritz a little silicone lubricant on the pipe, immediately prior to sawing. No lubricant handy? A little cooking spray will do the trick!